An alluring blend of jewel tones grace the giclee shade of this Harvest Stripe Arc Floor Lamp and render it a wonderful choice to highlight a hue-rich contemporary living area. This contemporary floor lamp features a bold shade design from renowned designer Stacy Garcia. 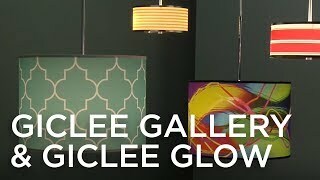 Known for her use of color and pattern, Stacy’s exclusive line of lighting makes a colorful and unique design statement. The shade is printed with the same technique used in reproducing museum-quality artwork. A plastic diffuser prevents glare. The base features a sleek, brushed nickel finish. U.S. Patent # 7,347,593. Custom giclee shade in a Harvest Stripe pattern print, with an acrylic diffuser at the bottom. Brushed nickel finish.